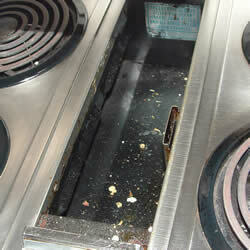 When this dishwasher was opened an odor was noted and when inspected, it was found to have rust on the drain. 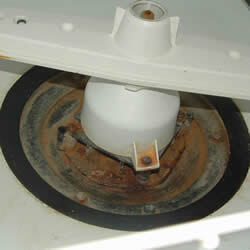 These findings show that this dishwasher is over 10 years old, at the end of it's life-cycle and needs replacement. The label on this stove (visible in the picture) states " Frequently remove filter and clean grease from filter and all other grease laden surfaces." However no filter was found. Without a filter, build up of grease and grime is greatly increased in duct work, as well as range. It is obvious that this grease trap is dirty and need of cleaning. This should be corrected because build up of grease in these areas can cause grease fires in homes, which can be extremely dangerous and destructive.